These American ceramicists and potters shaped future generations with works that were way ahead of their times. Born on January 29th, 1924 in Bozeman, Montana, such was the weight of American/Greek potter, Peter Voulkos' work the New York Times wrote that ‘few artists have changed a medium as single-handedly or markedly as Mr.Voulkos’. His impressive career spanned over fifty years and he was a huge influence in the ‘ceramics revolution of the 1950s’ (also known as the ‘American clay revolution’). Primarily, he was a sculptor working on fantastic free-formed large-scale pieces that were fired in electric and gas kilns. He blurred the lines between ceramics and fine art and was famous for glazing his pieces with sweeping visible brushstrokes. He also was known for using the method of wax resist in his decorating techniques. Fascinated by the east, he later moved to using an anagama kiln. An anagama kiln is an ancient type of Japanese kiln that fires in a single chamber with a firebox in it and has a huge sloping tunnel for ventilation and stoking. He was one of the first ceramicists to bring this kind of firing technique from the east to America. During his career, Peter founded the ceramics department at the Otis College of Art and Design and the University of California, Berkeley and was inspired by all the artists he met throughout this career from Robert Rauschenberg to John Cage and Willem de Kooning to Franz Kline. Peter died in 2002 and his work can still be seen everywhere from the Victoria and Albert Museum in London to the Smithsonian Institution in Washington DC. Husband and wife duo Vivika and Otto Heino potted together for over 35 years and they were known for just signing their work as Vivika + Otto, no matter which one of them made it. The couple were both of Finnish descent and met while studying ceramics in New Hampshire (Vivika was actually Otto’s ceramics tutor). Otto's interest in ceramics began after he watched pottery great Bernard Leach at work in his studio in the UK. The pair collaborated on their work right up until Vivika died in 1995 and their claim to fame, as well as being master potters and making ‘hearty and gutsy pieces’ was that they ‘reformulated a lost-to-the-ages Chinese glaze’ (which incidentally they never sold the recipe for). Their work was incredibly distinct, using mostly wheel thrown pieces that had a very modern Scandinavian flair, in homage to their heritage, perhaps. Vivika continued teaching throughout her life and over the years the pair produced thousands of unique pieces from their pottery studio, The Pottery in Los Angeles. Maria Martinez began learning how to make ceramics as a young child in her native Rio Grande Valley of New Mexico. Taught by her aunt, Maria became over the years most famed for her making of black pottery. And it’s for her lifelong work in black pottery that she garnered critical acclaim from across the world, as ‘one of the most famous craft artists in the world’, she was even invited to the White House by four different presidents. It’s been said that Maria created the ‘black on black technique’ and saved the tradition of ceramics in her hometown, which had begun to decline, given that people had taken to buying cheaper tinware to use as crockery instead of ceramics. 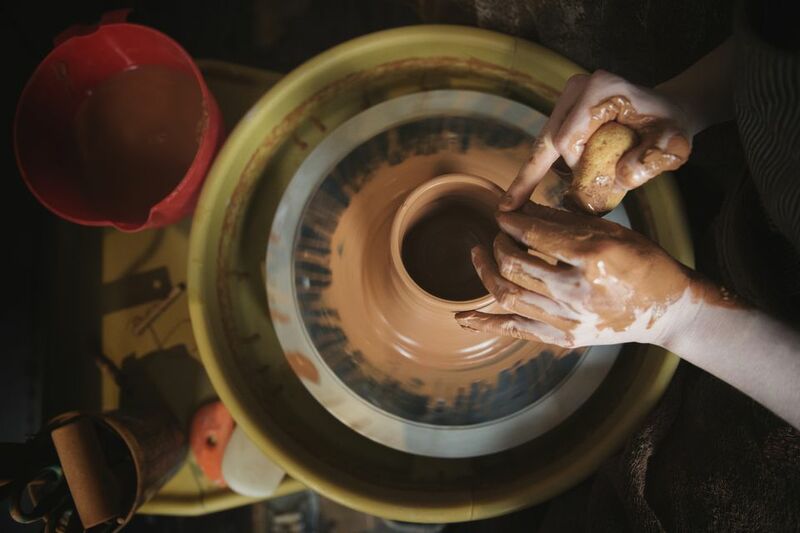 She discovered the best way to make her pottery was ‘smothering a cool fire with dried cow manure trapping the smoke and then using a special type of paint on a burnished surface’. The combination of these two things: trapped smoke and a low temperature in the fire, meant the ‘red clay pot turned black’. Maria’s work was brought to life even further with a brilliant collaboration with her creative husband Julian, he painted her beautiful ceramic works and really brought the polished pieces to life. Their unique and innovative ceramics work brought fame to the couple and also to their hometown.